1918. 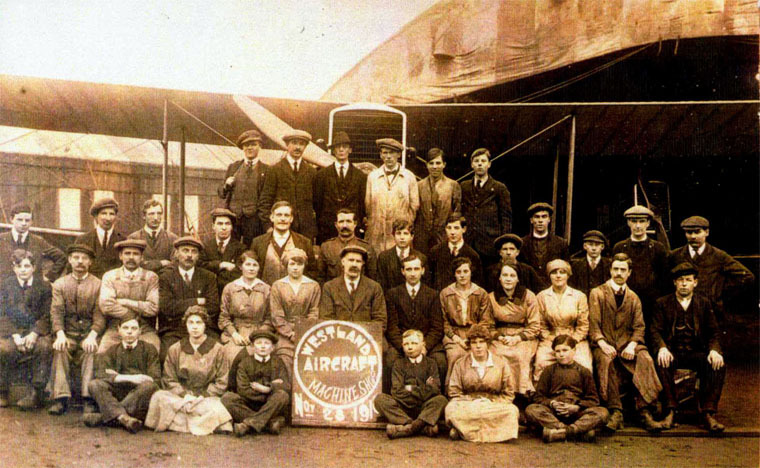 Wartime workers for Westland Aircraft. At centre Frederick George Hockley. Sept 1956. Mr. Leonard Thornhill. 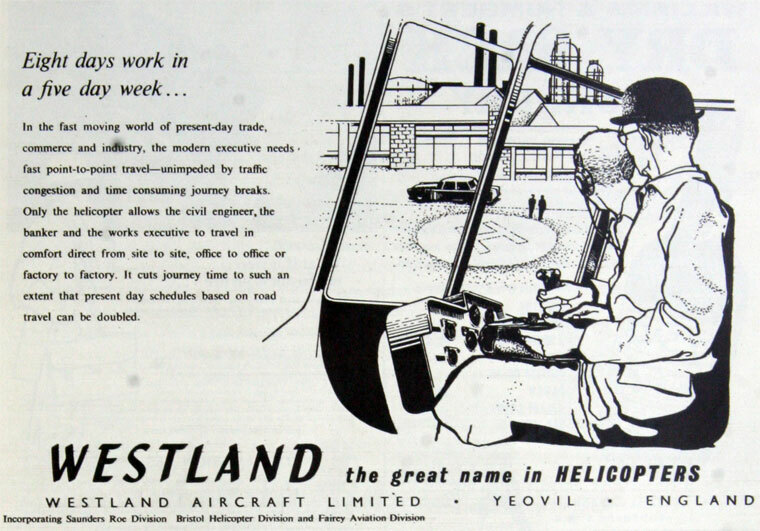 Westland Aircraft was a British aircraft manufacturer located in Yeovil in Somerset. 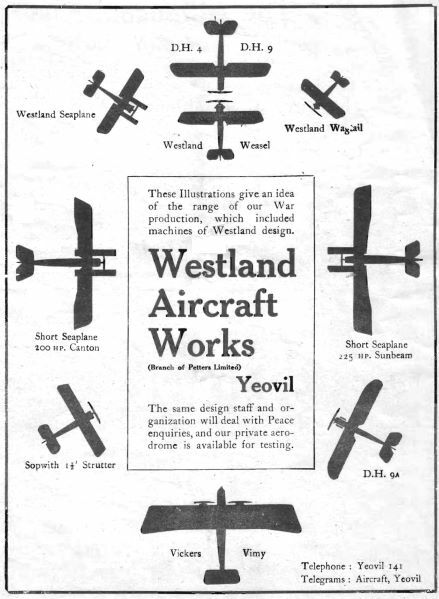 There is a separate entry for the Westland Aircraft models produced. 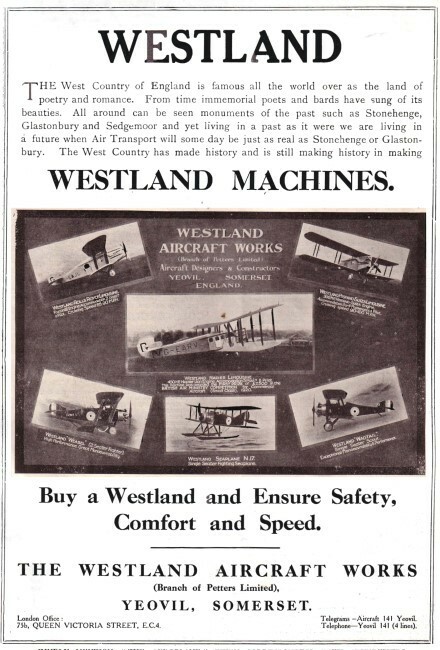 In 1915 the Westland Aircraft Works was founded as a division of Petters in response to government orders for the construction under licence of, initially, 12 Short Type 184 seaplanes, followed by 20 Short Type 166 aircraft. The factory adjoined Petters' engine works. 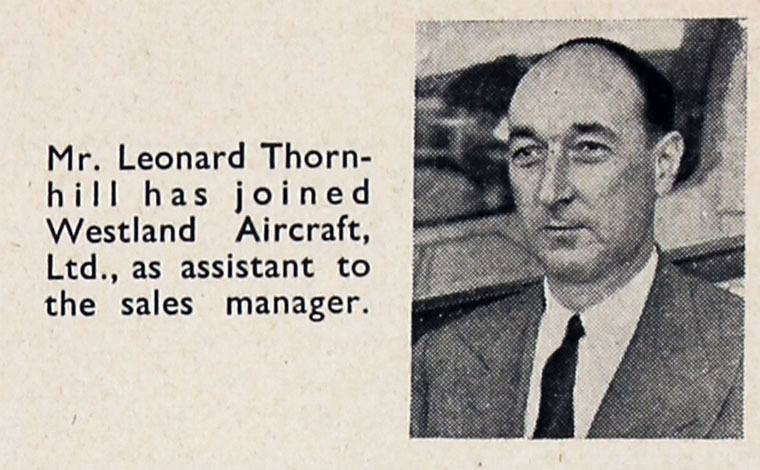 R. A. Bruce, former managing director of British and Colonial Aeroplane Co, was appointed as managing director. 1916 January: The first seaplane was delivered, tested, and accepted. From that time until the end of the war, aircraft of many types were delivered every week, and at the same time the factory and its equipment were considerably extended. Bruce demonstrated to technicians and craftsmen the methods required in an industry so entirely new to the majority of those working with him. By the end of the war he had built up a team of experts whose work commanded the highest respect in the aviation industry and in Government circles. Orders for other aircraft followed during WWI included the Sopwith 1 1/2 Strutter, the de Havilland DH-4, DH-9 and the Vickers Vimy. 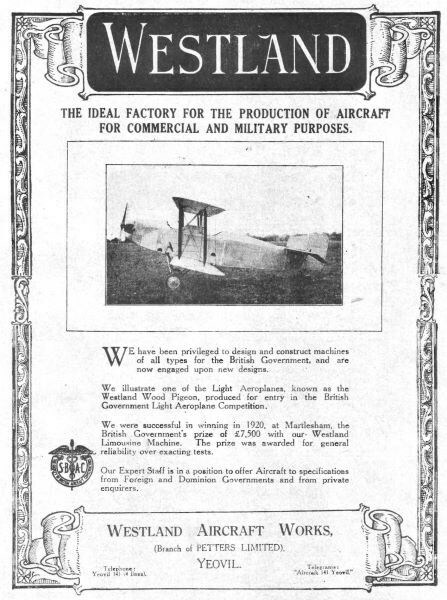 When the DH 9 bomber was found to have shortcomings in its design, Westland's drawing office was asked to redesign it to take the American Liberty engine. 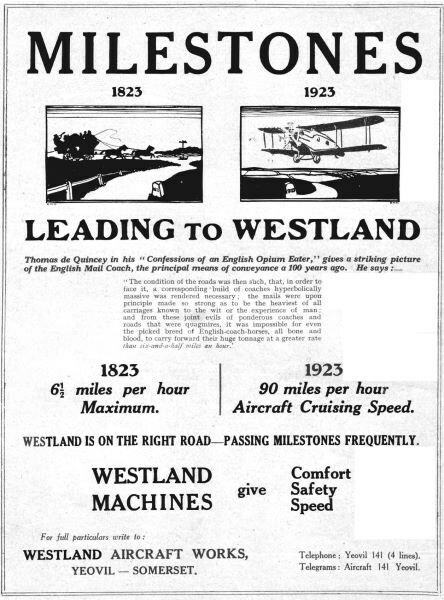 The success of the DH-9A brought Westland recognition. 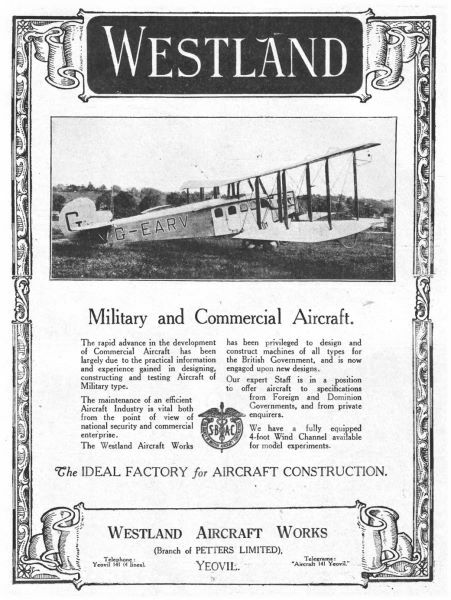 As a result of the experience gained in manufacturing aircraft under licence, Westland began to design and build its own aircraft, starting with the Westland N-1B in 1917, which was followed in 1918 by the Wagtail and the Weasel. 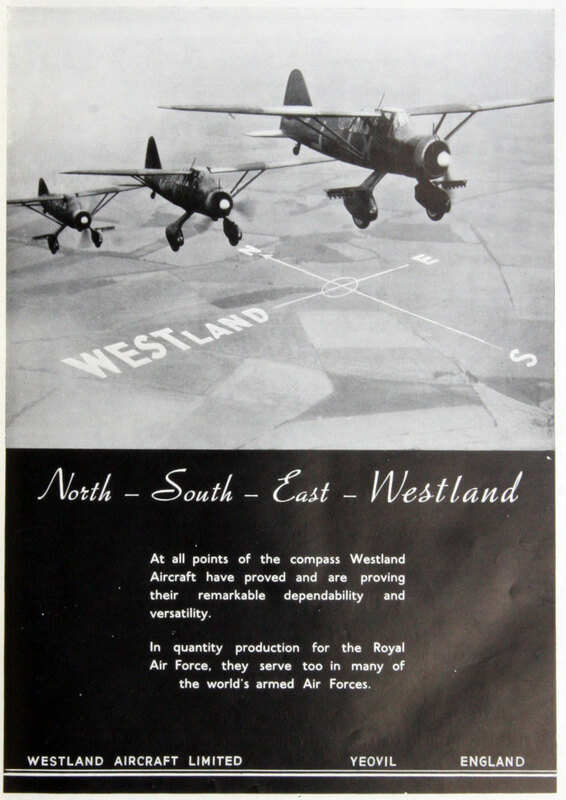 After the war, the aircraft industry suffered from cancellation of military contracts; Westland suffered along with the other military suppliers. The design office produced 17 new designs in this period but none was accepted until 1927. 1927 Westland Aircraft Works won the contract for a replacement for the DH-9A, the Wapiti. More than 1000 Wapitis were sold worldwide by the early 1930s, accounting for most of Westland's production between 1927 and 1934. 1933 Designers and constructors of military and civil heaver-than-air craft. Head Office and Works: Yeovil, Somerset. 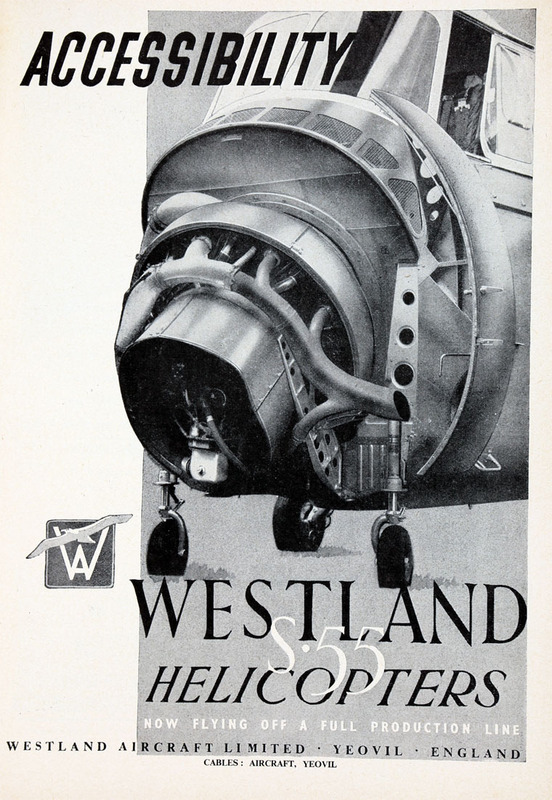 1934 Westland's built the prototypes of the Hendy Heck; one of the first was ordered by Mr. Whitney Straight. 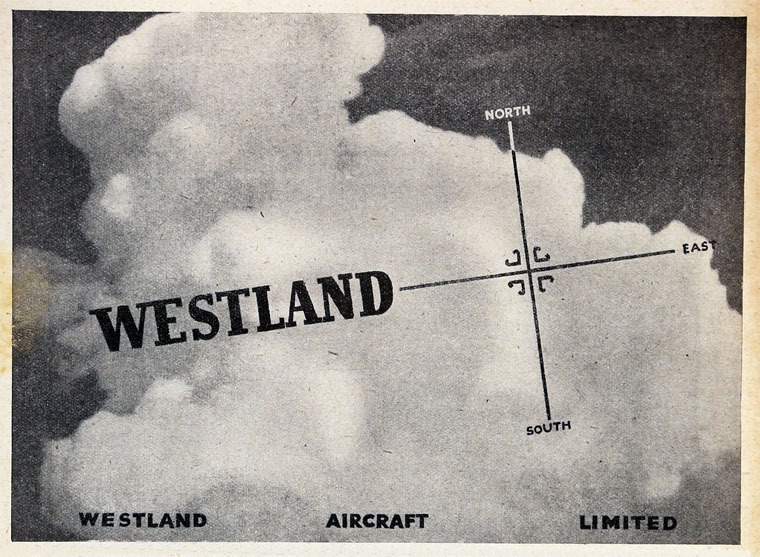 At the time Westlands was dependent on prototype work. The managing director and chief engineer was Mr Bruce. 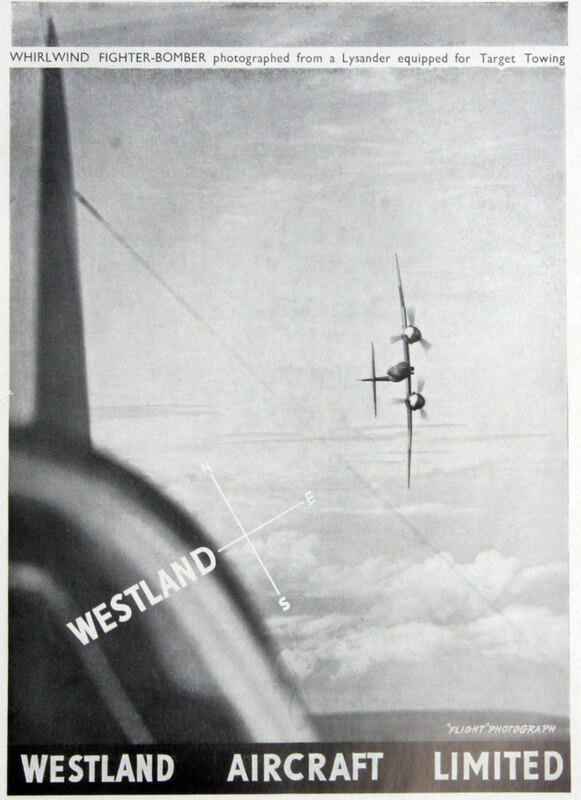 The Heck had an ingenious and effective slot-and-flap arrangement, which influenced the design of the Westland Lysander, which began flight trials in 1935 . 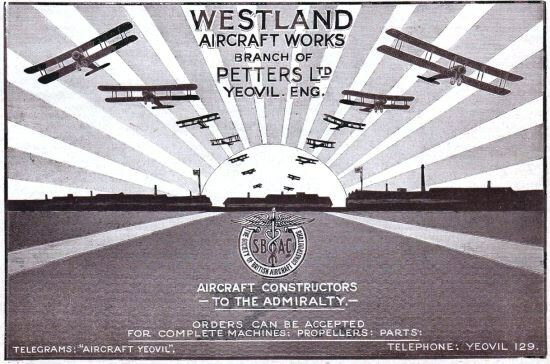 In 1935 Petters split its aircraft manufacturing from its engine business, forming Westland Aircraft Limited, based in Yeovil, Somerset. 1935 Became a public company. Petters Ltd retained half of the shares. 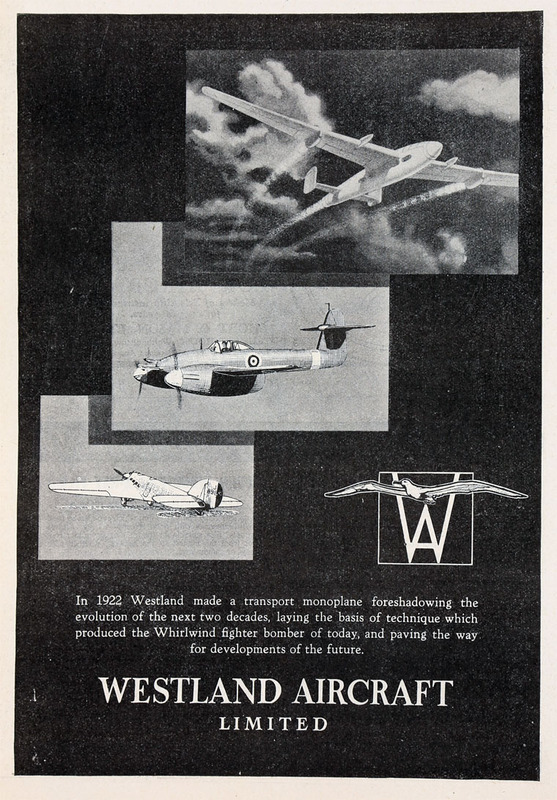 1938 John Brown and Co bought a controlling interest in Westland Aircraft Ltd. Sir Ernest Petter resigned as chairman and sold his shares to Associated Electrical Industries (AEI) . Percival Petter resigned as vice-chairman. WWII During World War II the company produced a number of undistinguished military aircraft including the Lysander, the Whirlwind and the Welkin. For much of the war their factories were used to build Spitfires, after the Supermarine factory in Southampton was put out of action by bombing during the Battle of Britain, indeed Westlands built more Spitfires than any other manufacturer. Westland would then go on to be the major designers of the Supermarine Seafire, a navalized conversion of the Spitfire. 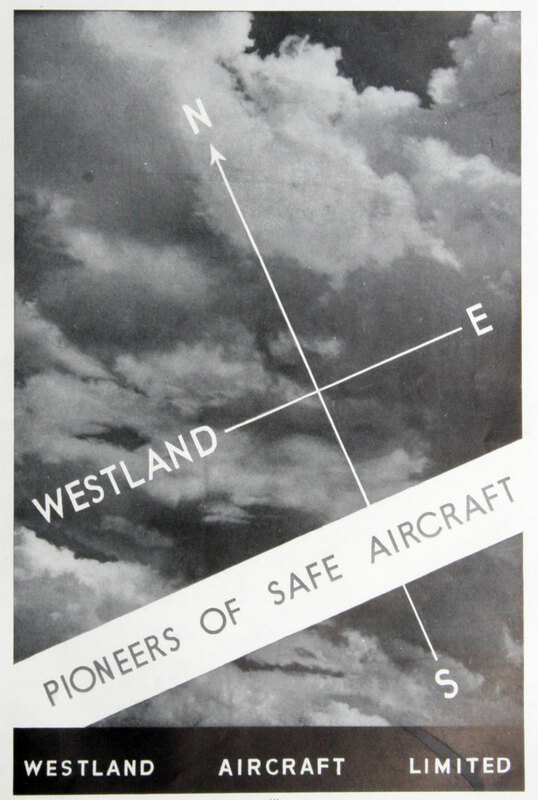 1944 Established Westland Engineers, a subsidiary intended to train staff. Post-war the company decided to get out of fixed-wing aircraft and concentrate solely on helicopters under a licensing agreement with Sikorsky. This upset W. E. W. Petter, the chief designer, who left to form a new aircraft division at the English Electric Co that would go on to be very successful. Production started with building of the Sikorsky S-51, which became the Dragonfly, flying for the first time in 1948, and entering service with the Royal Navy and RAF in 1953. 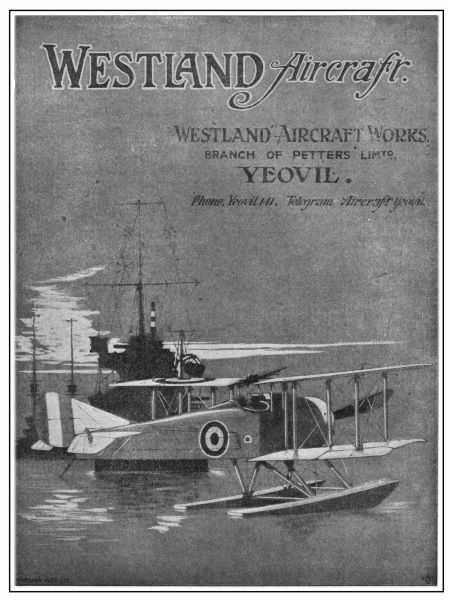 Westland developed an improved version the Widgeon which was not a great success. Success with the Dragonfly was repeated with the Sikorsky S-55 which became the Whirlwind, and a re-engined Sikorsky S-58 in both turboshaft and turbine engine powered designs as the Wessex. The chairmanship of Eric Mensforth from 1953-1968 marked the start of the transition which was aided by the government when in 1959-1961 they forced the merger of the 20 or so aviation firms into three groups: British Aircraft Corporation and Hawker Siddeley Group took over fixed-wing designs, while the helicopter divisions of Bristol, Fairey Aviation Co and Saunders-Roe (with their hovercraft) were merged with Westland. 1959 Purchased Saunders-Roe from S. Pearson Industries, and the helicopter divisions of Bristol Aeroplane Co Ltd and Fairey Aviation Co, funded by issue of shares. 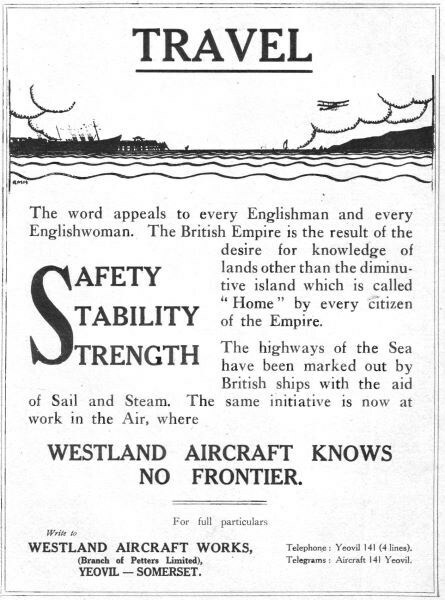 John Brown's holding in Westland Aircraft Ltd was reduced but that company retained control. 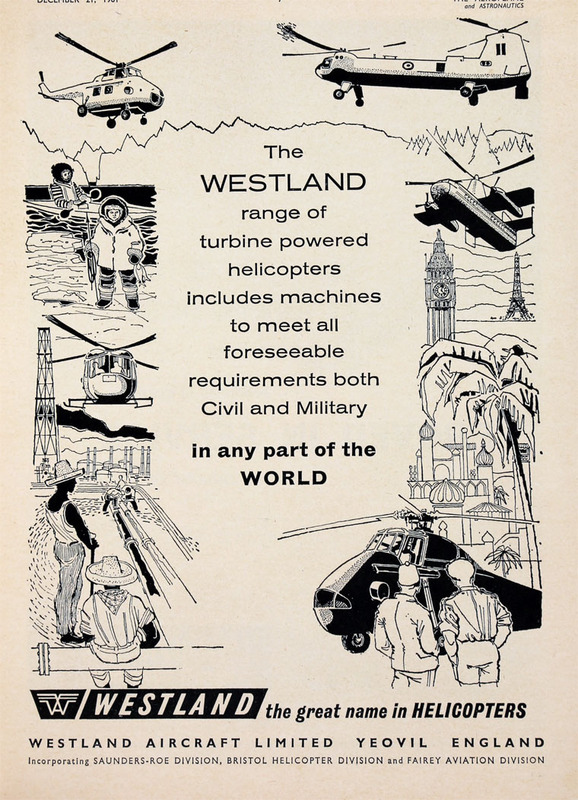 Westland also owned Normalair Ltd and Westland Engineers Ltd.
1961 Westland Helicopters was formed. Westland inherited the Saro Skeeter helicopter, a development of the Skeeter (the P531) and the Fairey Rotodyne compound helicopter (gyrodyne) design. They continued to develop the latter sidelining their own Westland Westminster large transport design. 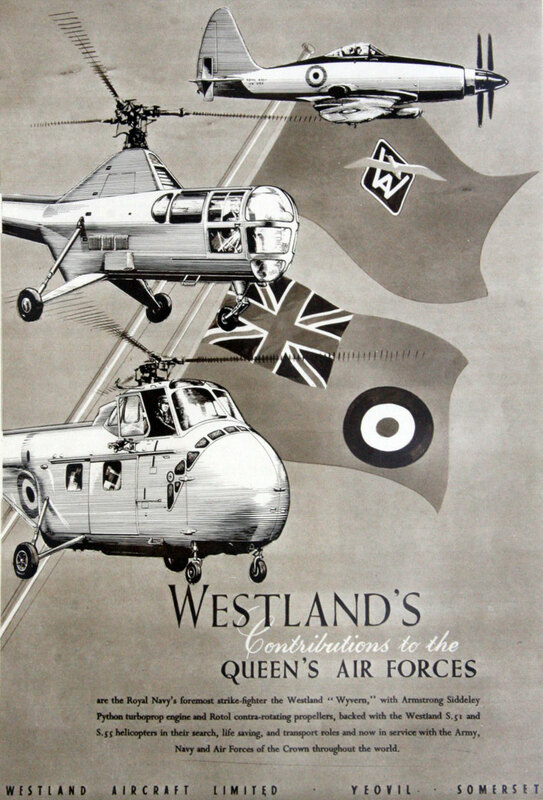 Westland produced other aircraft under licence from Sikorsky (Sea King), or Bell (Sioux). They produced their own designs the Westland Scout and its naval variant the Westland Wasp from the P.531 which found favour with the Royal Air Force and Fleet Air Arm respectively. In the late 1960s the company started a collaboration with Aerospatiale to design three new helicopters, the Aérospatiale Puma, Aérospatiale Gazelle and Westland: Lynx, with the latter being primarily a Westland design. For many years Westland owned the main London heliport at Battersea. 1984 Despite good support from the British establishment, the company gradually fell into unprofitability. 1985 Sikorsky approached with a bail-out deal that split the British Cabinet and led to the resignation of Defence Secretary Michael Heseltine in January 1986 over the fate of Britain's sole helicopter manufacturer. The split, which became known as the Westland affair, was over whether to push the company into a European deal or accept the US company's offer. 1988 GKN bought into Westland, initially acquiring a stake owned by Hanson plc. They soon acquired the shares owned by Fiat which gave them absolute control. 1994 Westland became a wholly owned subsidiary of GKN. 2004 Finmeccanica S.p.A. acquired GKN's share in the joint venture. See Westland Aircraft for a list of Westland Fixed-Wing Aircraft and Helicopters. 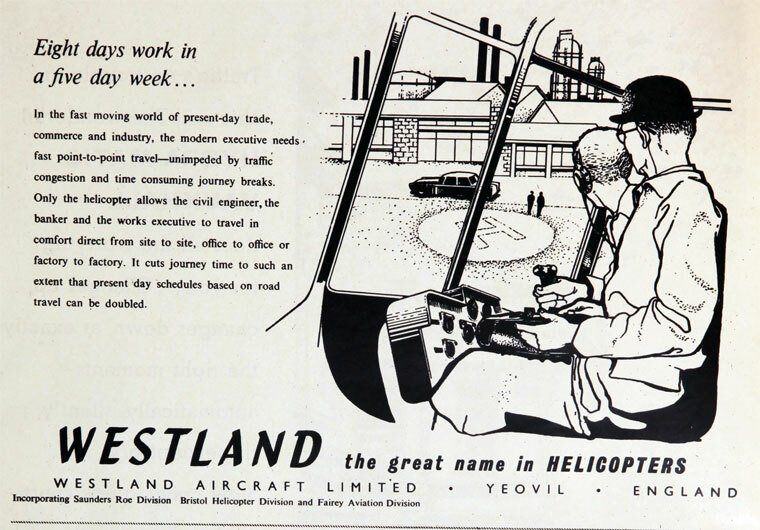 The Westland site at Yeovil is known in the local area as 'Wastelands' and the company as 'Wasteland Helicopters'. Past and present employees also often refer to the company as such. The former Westland site at the now-disused airfield in Weston-super-Mare houses the Helicopter Museum featuring a number of examples of Westland aircraft. Pride of place is given to an immaculate Westland Wessex HCC Mk.4, formerly of the Queen's Flight. This page was last edited on 7 November 2018, at 14:22.